Precious few things are as seemingly simple as a scuba cylinder, but don’t let that fool you. Although a cylinder may seem like a dumb hunk of metal, it does serious work. Filled to capacity, a typical cylinder carrying 80 standard cubic feet of air — enough to fill a phone booth — compressed to a pressure of 3,000 psi carries a total energy roughly equivalent to an automobile traveling at jet airliner speeds. More important than that, our scuba cylinder carries our most precious cargo of breathing gas to sustain us for the duration of our dive. Without a doubt, a high-pressure scuba cylinder is something worthy of respect. To ensure our continuing safety below and above the waves, scuba cylinders demand at least a modicum of attention to selection, use, care and maintenance. 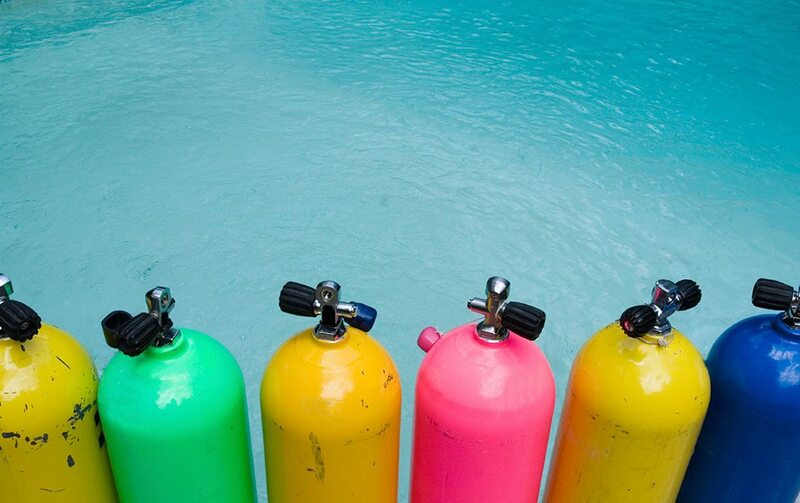 While cylinders are marketed under a number of brand names, only a handful of manufacturers produce scuba cylinders in the United States, including Catalina, Faber, Luxfer, and Pressed Steel Tank Co. (PST). Creating a scuba cylinder is no minor feat, and it requires a great deal of pressure. Steel cylinders are made using a process called “deep draw,” while aluminum cylinders are made by “backward extrusion.” After the material is put through a series of punches and dies, the result is a shell that resembles a large coffee cup. In both processes, heat is applied to the top or neck of the cylinder to create a narrow opening, which is then threaded for insertion of the cylinder valve. At this point, the cylinder is stamped with appropriate markings, hydrostatically tested, and is ready for service. Since a scuba cylinder contacts water, great pains are taken to minimize the potential for corrosion. PST, which has been manufacturing scuba cylinders since 1951, uses a hot dip galvanizing process to create a protective coating on its cylinders. Although aluminum cylinders are inherently resistant to corrosion, polyester powder resin finishes are sometimes applied to the exterior to enhance corrosion resistance and to provide the aesthetic qualities desired by the consumer. Most commercial operators prefer the shot-blasted or brushed aluminum finishes, since these are easier to inspect and maintain. As part of the manufacturing process, the cylinder is tested for defects, and then the neck of the cylinder is stamped with information required by the Department of Transportation (DOT), the agency that regulates interstate transportation of cylinders, or the governing agency in the country where the cylinder is manufactured and sold. Cylinders are made from a variety of materials, and can be found in an amazing variety of shapes and sizes. The most common materials are aluminum and steel, each of which has characteristics that make them more suitable for particular diving applications. Due to the strength-to-weight ratio of the base material, aluminum cylinders tend to be larger and more buoyant than steel cylinders of the same capacity. They also cost less than their steel counterparts, and for this reason have gained tremendous popularity among recreational divers. Steel cylinders tend to be physically smaller for the same capacity, and are less buoyant when submerged. For these reasons, steel cylinders are often the favorite of cold-water divers, and those who dive in the close quarters of overhead environments. Luxfer now offers a high-tech scuba cylinder made of a composite material designed for high pressure and low weight. These are basically aluminum 80-cubic-foot cylinders hoop-wrapped with fiberglass to increase their strength. Essentially the same size and weight as a typical aluminum 80, these 4,350-psi pressure vessels pack a proud 105 cubic feet of breathing gas. Cylinders come in a stunning variety of capacities, from small Spare Air™ emergency breathing air cylinders, to 13-cubic-foot pony bottles, to monstrous cylinders packing more than 130 cubic feet of compressed breathing gas (see Table 1). Most recreational divers choose something in the middle — 65-100 cubic feet — for their main cylinder, and those at the short end of the spectrum for redundant air supply needs. Although they are sometimes sold separately, the valve is often considered an integral part of the cylinder. And just as there are a variety of cylinders, valves, too, can be categorized according to their performance, features and capabilities. The basic distinction among cylinder valves is between the standard yoke (K-style) valves with which most divers are familiar, and the DIN valves (for Deutsches Institut fuer Normung, a European association of engineers and manufacturers that sets standards for compressed gas cylinders and valves). The DIN fitting of the regulator first stage actually screws into the female threaded DIN valve body, capturing the O-ring and making it virtually impossible for the O-ring to fail and cause a loss of breathing gas. Technical divers often prefer DIN valves for precisely this reason. PST’s new E-Series cylinders feature a yoke/DIN connection that allows the diver to use either connection, depending on his or her regulator configuration. One feature common to all cylinder valves is a pressure relief device (PRD), also known as a burst disk. This tiny, frangible disk is designed to break and release the pressure within the cylinder when it reaches a critical pressure (close to the hydrostatic test pressure of the cylinder). This can happen as a result of overfilling, or due to an increase in the temperature of the cylinder. If a new valve is installed, or valves are switched between cylinders, care must be taken to ensure a PRD is installed that corresponds to the cylinder’s service pressure. One fact that divers sometimes overlook is the changing buoyancy of their cylinders. Regardless of whether the cylinder is made of steel, aluminum, or a composite, the air which we compress into that cylinder has mass and weight. Since the cylinder is essentially a rigid container, its volume doesn’t change (noticeably) when filled to capacity. However, its weight does. The greater the capacity of a cylinder, the greater the weight difference between empty and full. A standard cubic foot of air weighs about 0.0807 pounds, so for about every 12 standard cubic feet of air we compress into our cylinder, the weight of that cylinder increases 1 pound. The typical aluminum “80,” which carries about 77.4 standard cubic feet of air, weighs about 31 pounds when empty, and about 37 pounds when full. A cylinder that carries 120 cubic feet will weigh about 10 pounds more when full than it does when empty. Although the change in buoyancy for a given air capacity is the same regardless what the cylinder is made of, the actual buoyancy figures are different depending on the material and cylinder design. A typical aluminum 80 might be a pound and a half negatively buoyant when full, with a positive buoyancy of about 4.5 pounds when empty. A steel cylinder of similar capacity might be around 6 pounds negative when full, and neutral when empty. Consequently, a diver using an aluminum cylinder would generally need to carry more weight on his belt to avoid becoming positively buoyant at the end of a dive than one wearing a steel tank of the same capacity. Manufacturers are constantly improving their offerings, and Luxfer now offers a “neutral buoyancy” 80 (NB80) with improved buoyancy characteristics. By adding additional material (about 4 more pounds of aluminum) primarily to the bottom and barrel, the cylinder is neutrally buoyant in seawater when empty and floats in a more horizontal orientation than typical aluminum 80s. Divers and cylinder manufacturers have long debated the pros and cons of aluminum vs. steel scuba cylinders. Without a doubt, both are rugged and reliable, and will safely meet the needs of some — if not all — divers. The best choice for a diver depends on a number of variables, including his physical makeup and the environment in which he dives. Obviously, buoyancy characteristics are a major consideration when choosing a cylinder. Since aluminum cylinders are more buoyant, they may be a better choice when diving in warm water where a diver wears less buoyant exposure protection, and thus needs less weight to achieve the correct buoyancy. For a diver in cold water wearing a thick wet suit or dry suit, the steel cylinder would lighten the load on the weight belt. Also important are the physical dimensions of the cylinder. A basketball-player-turned-diver might be quite comfortable with a tall aluminum cylinder strapped to his back, whereas a jockey-size diver might prefer a stockier steel cylinder to avoid the brain-bashing that can come when the cylinder length approaches the length of one’s spine. Capacity is also critical. A heavy breather, the buddy of a heavy breather, or a cold-water diver might require more air to meet his diving needs than one who consumes air more efficiently or dives in warmer water. 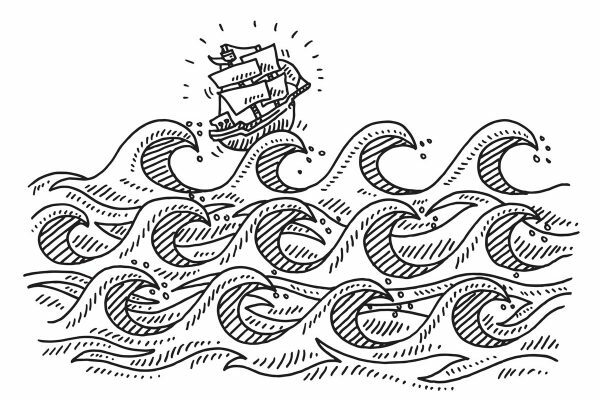 Needless to say, those who dive deeper, or venture into caverns, caves and wrecks may also require considerably more air capacity than their shallow, open-water counterparts. If you intend to travel to remote areas with a high-pressure cylinder, keep in mind that not all air stations can fill to higher pressures. Check to see that high-pressure fills are available at your destination. Scuba cylinders are heavy, and if not handled properly, can easily damage other gear or injure a diver. Rule No. 1 is to make certain the cylinder is secured properly during transport. Never leave a cylinder standing in an upright attitude, since it can easily be knocked or tipped over. Merely laying the cylinder on its side is inadequate, especially in a van, car, truck or boat where accelerations, decelerations, turns and bumps can cause a cylinder to roll. When it comes to carrying or moving a cylinder, even the professionals have differing opinions. There’s general agreement that a cylinder can be safely lifted and carried by the valve, but doing so can put excessive strain on muscles and joints. Some recommend lifting cylinders with the buoyancy compensator (BC) attached, and wearing the BC as a means of carrying the cylinder, as doing so will help avoid injury. Others think that lifting or carrying a cylinder by the BC straps makes dropping the cylinder a more likely outcome. A variety of devices are available that are designed to make scuba cylinders safer and easier to carry. However you decide to carry the cylinder, remember to do so carefully, and always lift with your legs rather than your back to avoid injuries. Regardless of the type and size of cylinder, it’s important to get a good (and safe) air fill. The first thing to make certain of is that the technician filling your cylinder knows the correct cylinder pressure. It’s easy to make an assumption that leads to an overfill or underfill — either of which poses a safety concern. The service pressure for the cylinder assumes a temperature of 70 degrees Fahrenheit (21 degrees Celsius), so even a properly filled cylinder will show higher (if hot) or lower (if cold), depending on the temperature. Make certain your cylinder is being filled with the right stuff. Remember that aside from air, many air stations now provide nitrox, oxygen and argon to meet the needs of nitrox and technical divers. Having the wrong gas in your bottle can lead to serious consequences, so take the time to verify what’s being put in yours. Air quality is always a potential concern, especially when diving in out-of-the way places. If the fill station seems suspicious, ask to see the station’s air quality monitoring or maintenance records. Take a look at the compressor inlet, and if it’s located where exhaust fumes or other contaminants could be present, think twice about filling your cylinder. Oxygen and carbon monoxide monitors are readily available, and can add peace of mind for divers who travel to locations with “backwoods” filling stations. Before connecting the fill line, the connector should be either blown or wiped dry. It’s just too easy for water to be forced into your cylinder during the filling process, and that can spell both corrosion and air quality problems. Finally, the fill shouldn’t be done too quickly. NOAA recommends a fill rate of 300-600 psi per minute to prevent excessive heating during the fill. Once your fill is complete, double-check that your cylinder is securely fastened to your BC. Since nylon stretches when wet, some divers wet the nylon straps of their cylinder harnesses before mounting to ensure they are securely fastened. A loose cylinder can be a safety hazard for those wearing them, as well as anyone below them in the water. While cylinder maintenance isn’t very difficult or time-consuming, failure to properly care for your cylinder can lead to expensive and dangerous consequences. First, make certain your cylinder is visually inspected and hydrostatically tested on a regular basis. An annual visual inspection is recommended, but if a cylinder is used frequently in warm, humid climates, the inspections should be performed more frequently (every three to six months). Hydrostatic tests are required every five years, or any time a cylinder is damaged. Regular maintenance for cylinders includes washing with a warm, soapy water to remove salts and other contaminants that can cause corrosion or other damage. If your cylinder has a boot, it should be removed to ensure that no corrosion is forming beneath the boot. Inspect the cylinder for pitting, corrosion, dents, scrapes, cracks or other damage. If any such damage is evident, have a professional inspect the cylinder to ensure it does not pose a safety concern. Don’t completely empty the cylinder while diving, except in an emergency. Relieving all the pressure in a wet environment can allow moisture to enter the cylinder. If a cylinder must be emptied for transport (such as by an airline), put some tape or other covering over the valve inlet to prevent contaminants from entering the cylinder. For long-term storage, cylinders should have only a few hundred psi, and should be stored upright in a cool, dry location. Scuba cylinders are simple and reliable, but they also carry our most precious commodity for exploring the underwater world. By choosing wisely and giving the proper care, we can help ensure that our cylinder has a long life, and continues to provide us with that all-important ingredient for life — air. Like any piece of dive equipment, a scuba cylinder requires proper care and maintenance if it is to serve us well over time. Since fill stations put themselves at risk every time they fill a cylinder, they pay strict attention to the indications that the required inspections have been completed. First is the visual inspection, designed to find any mechanical or corrosion damage to the cylinder, both inside and out. Inspectors check the exterior of the cylinder for many forms of damage, including cuts, gouges, dents, and bulges, signs of heat damage, general abuse, the condition of coatings, and a current hydrostatic test date. The valve is removed, and the interior inspected for debris, water, corrosion, pitting, thread integrity, and internal neck cracks (in aluminum cylinders). If corrosion is found, it may be necessary to “tumble” the tank — a process that involves insertion of abrasive material, and then rolling the tank to remove the corrosion. When a visual inspection is completed, a sticker is applied to the cylinder indicating the test date. Visual inspections are generally required every calendar year, but under harsh conditions (hot, humid, frequent use) should be performed every three to six months. Under the DOT regulations, all cylinders pressurized to more than 900 psi must also undergo hydrostatic testing every five years to verify their structural integrity. Although there are variations in the process, it typically involves filling the cylinder with water, placing it in a water-filled pressure chamber, and measuring the expansion of the cylinder as pressure is applied. Hydrostatic test pressures vary depending on the cylinder material, but is typically 5/3 the service pressure. The PST HP Series (3,500 psi) and the new E-Series with a service pressure of 3,442 psi, manufactured under the E-9791 permit, are tested to 3/2 the service pressure. If the permanent expansion of a cylinder is 10 percent or more, the cylinder is condemned and removed from service. Although cylinders only require hydrotesting every five years, certain unusual conditions would warrant additional hydrotesting. Any time a cylinder sustains physical damage or is exposed to high temperatures, the integrity of the cylinder is suspect, and a hydro is warranted. Experts at Catalina Cylinders warn against exposure to temperatures in excess of 265 degrees Fahrenheit. CGA (Compressed Gas Association) standards require that aluminum cylinders exposed to temperatures over 350 F be condemned. An additional test, called eddy current testing, is also used on some aluminum cylinders (those constructed of 6351 aluminum alloy in particular) to detect minute cracks in the cylinder thread areas that are otherwise difficult to observe. Detection of such cracks may also result in removal from service. When a cylinder passes its hydrostatic test, new markings are stamped into the crown of the cylinder to indicate the test date. Just because a cylinder passes hydrostatic test is no guarantee that it will pass the visual inspection. Since the visual inspection is less costly, consider having it done first if a cylinder is in need of a hydrostatic test. It could save you money in the long run. Message On A Bottle: What do the markings mean? While the markings on the neck or “crown” of a scuba cylinder may appear as mysterious as ancient Sanskrit, decoding the message is quite simple once you understand the basic format and symbols. The first grouping of letters and numbers identifies the governing agency (DOT for U.S.-manufactured cylinders, and Transport Canada or “TC” for those made in Canada) followed by a material designation (manufacturing specification). Some old U.S. manufactured cylinders may still have ICC (Interstate Commerce Commission) rather than DOT designation. Steel cylinders generally carry the 3AA designation, or E9791 for those rated for 3,500 psi. Most aluminum cylinders carry a 3AL designation (3ALM in Canada); however. older aluminum cylinders may have a designation of SP6498 or E6498. Next comes the service pressure, followed by the cylinder volume. For U.S.-made cylinders, the pressure is given in psi (e.g. “3300” for a 3,300 psi cylinder). Canadian-manufactured cylinders have service pressures stated in bar (e.g. “207BAR”). Some steel cylinders will have a “+” following the service pressure, indicating that during the first five years following manufacture, the cylinder can be filled to 10 percent over the indicated service pressure. Some manufacturers also include the capacity of the cylinder as part of the markings on the first line. In the example above, the S100 indicates a 100-standard-cubic-foot air capacity. The first grouping of numbers on the next line is the serial number for the cylinder. The serial number is typically a combination of six to eight letters and numbers. Following the serial number on some cylinders is the manufacturer. Some also display the “M” number, or the manufacturer identification number, issued by the governing agency (DOT). The markings end with the month and year of manufacture, separated by a manufacturer’s unique symbol. Each time a cylinder is hydrostatically tested, a new month and year is added to the markings, separated by a unique symbol designating the independent inspection agency (IIA) performing the test. Thus, it’s easy to tell whether a cylinder has a valid hydrostatic test. Not all manufacturers follow the same format for cylinder markings, but this simple guide will at least provide the pertinent data and overall context of the message on your bottle.